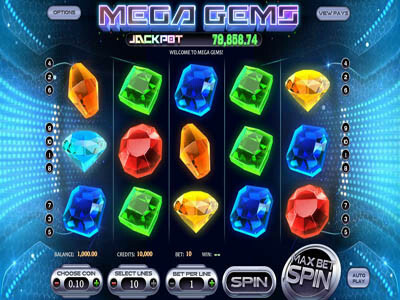 Mega Gems is a 5-reeled video machine that is developed by one of the biggest names in the online gaming industry, Betsoft Gaming. The game is themed around diamonds and other precious stones that players will see spinning on the reels and the lines of the video slot machine. Players can enjoy this mesmerizing experience right here for free without having to place any real money bets or make deposits. The game has 10 lines that offer players a great set of line payouts that they can claim during the gaming experience. The game also comes with a wild icon that can replace other icons as well as a special jackpot symbols that can trigger the progressive jackpot prize that the slot game has.